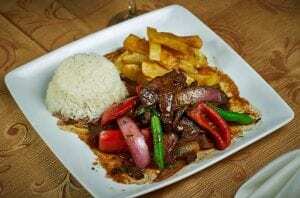 This recipe was adapted by a Peruvian friend from a traditional recipe. Enjoy! And yes, there are white-tailed deer in Peru! Heat 1 tablespoon of canola oil in a large skillet over high heat. Add venison and quickly sauté until venison is seared and browned on all sides. Remove pan from heat and transfer venison to a plate. Save covered. Return pan to medium-high heat and add the rest of canola oil. Add onions and sauté until edges are softened, about 2-5 minutes. Add tomatoes, parsley, salt, pepper, soy sauce and vinegar. Sauté until tomatoes have softened, about 2 minutes. Add venison and lime juice, and toss gently. Serve with rice and oven-baked French fries.